Winter weather warnings in the news aren’t just a prompt to wrap up warm. They’re a wake-up call to homeowners that some roof care is going to be required. You might be tempted to wait until spring when the job will be more comfortable, but leaving large drifts of snow and ice on your roof can be problematic. Below, we’ve listed the key reasons why winter roof care is so necessary. We’ve also given some tips on how to take care of the problems before they get too serious. The first problem you need to be aware of is the sheer weight building up on your roof. Snow never seems like a “heavy” substance when you pick it up, but when it builds up in drifts, the weight accumulates. In general, roofs aren’t designed to handle the weight of heavy loads. So the snow and ice can lead to roof sagging, cracks and leaks, and even collapse if left untended. If you hear creaking from your roof or hear drips in your attic, you need to get your roof cleared right away. Otherwise, you’ll be facing a much more expensive problem. Since water expands by around 9% as it freezes, this increases the outward pressure acting on your gutters. This can damage them. Furthermore, the formation of ice in the gutters can also prevent snow from melting and draining from the roof as water, since the drainage system is blocked. This means that the weight problem on your roof will get even worse, as the snow and ice are stuck behind a ridge, or “wall,” of gutter ice. 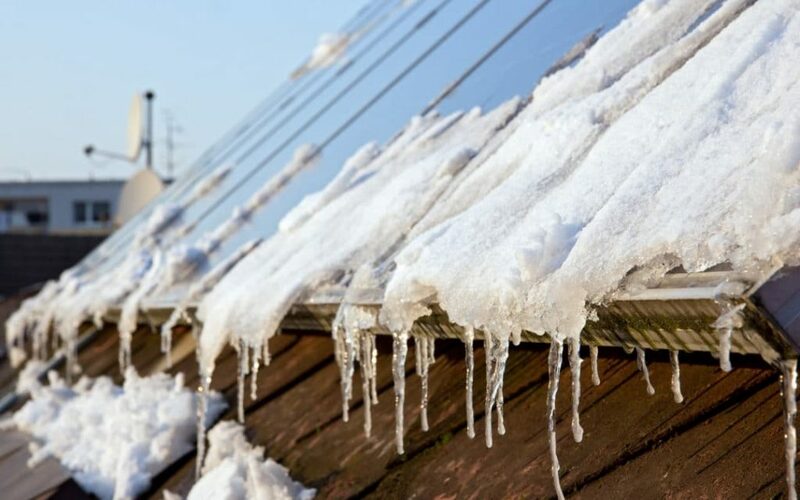 Roof care services may be required to remove this ice before it causes gutters to collapse. Icicles can also form underneath the gutters, which can fall and injure people. Better insulation in the attic can help to prevent both problems. With poorly insulated roofs, warmth from your home is melting the snow and driving it into the cooler gutters – where it reforms as ice. When warm air meets cold air, the warm air cools and releases water vapour. This process is known as condensation. On a cold day, this can happen in your attic, as warmer air in your home rises to meet the frigid temperatures from the outside. Heavy condensation can lead to wooden structures rotting and issues with mould. Both represent a severe risk to the safety of your family. Proper insulation is key to reducing this risk. It’ll prevent the cold air from entering your home so that there’s far less condensation occurring. If you’re a homeowner in Calgary struggling with the winter weather, H & J Roofing Solutions can help to repair problems and prevent them from reoccurring. Our professional team can also offer expert advice on how to reduce the risk of roof damage even further this winter. Give us a call today at (587) 433-9746 or read our blog for more advice on taking good care of your roof throughout the year.